If you have a beautiful wooden deck, you understand the maintenance that comes along with it. 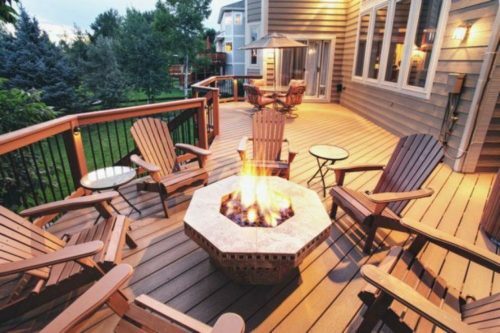 Beautiful decks require a little (or a lot) of TLC to keep them looking their best. Most of deck maintenance is not rocket science, but too often results in wasted efforts and wasted materials. A great looking deck doesn’t come easily, wait until you are in a patient mood to do it right, and you will love your results. Here are common mistakes that can actually ruin an otherwise perfectly good deck. 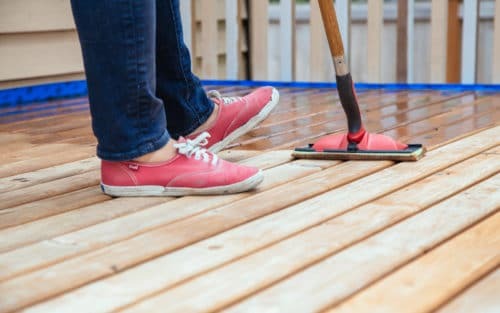 Staining the deck is a big job, but don’t try to make it easier by skipping the cleaning part. Invest in purchasing or renting a pressure washer first. You must wash AND sand before applying anything. No if’s and’s or but’s about it. Use a power sander and it will be done sooner than you think, my favorite sander is like this sander found here, it is cheap and dependable. If you have a large deck I would consider buying a belt sander like this one,, which is made specifically for large flat areas such as a deck. 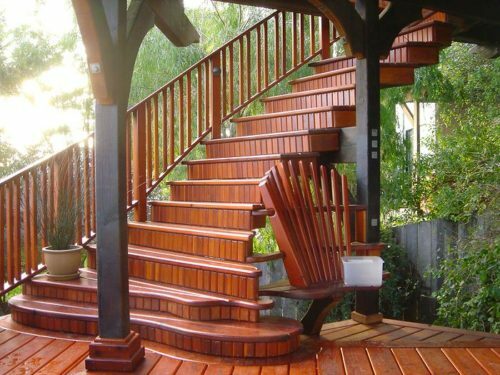 Remember you will need to maintain that beautiful deck and stain it more than one time. A sander is a smart investment. The truth is, more is just wasted product. 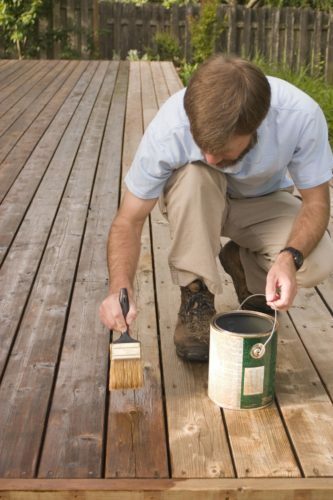 Most deck stains are designed as a single-coat system that penetrates the wood. Extra coats do nothing except sit on the previously coated surface and then eventually drying, flaking, and peeling away. Apply one coat, and make sure you do enough to cover the surface. Stand back and admire that beautiful deck! #5-Doing it all in one day. If you’re staining your deck properly, you can’t do it in one day. After pressure washing (essential step 1), you have to let the deck dry COMPLETELY. This usually takes at least a week or so. Check the local weather and make sure there is no chance of rain. Clean your deck and allow it to full dry. Once it has dried, grab a broom to sweep off any loose dirt and dust. Then you are ready to start staining your deck. Staining a deck in the middle of the day is a bad idea. Not only is it uncomfortable and exhausting to work in the heat of the day, but the paint also dries too quickly and won’t absorb properly into the wood. Start early in the morning and quit before noon. New decks act differently than old ones. Give new wood at least six months before staining. This allows the wood to season and release some moisture. Otherwise it won’t accept the stain well. On the other hand, older decks will need a through cleaning and sanding. I would use a pressure washer for a quick job, if it’s really in bad shape. Even if you follow all these steps there are some stain brands that just don’t last very long. My first time I stained my deck, I did all that I have talked about. I didn’t want to have to restain anytime soon, so I was methodical about it. I also was a newlywed with a baby on the way. We bought the cheaper brand I found at Walmart. Personally, I use Minwax as my preferred brand. I have also heard good things about, General Finishes and DEFY. Make sure to pick a stain that is for exteriors. If you are using a water-based stain, remember that the color of this stain will only last 2-3 years. If you are using an oil based stain, that can will stay true to it’s shade for 10 or more years! If you find a brand and color you love, stock up! Generally, we applaud hard work, but trying to reach top speed while staining will likely lead to lap marks on the wood. Instead of a sprint, see a deck stain as a marathon, methodic and evenly paced along each board. Work slowly and work the paintbrush back and forth until it gradually runs out of stain, keeping the lap marks wet so you can blend in along the way. Staining quickly results in uneven coats and drips all down the sides. Take your time, to make this wood beautiful. 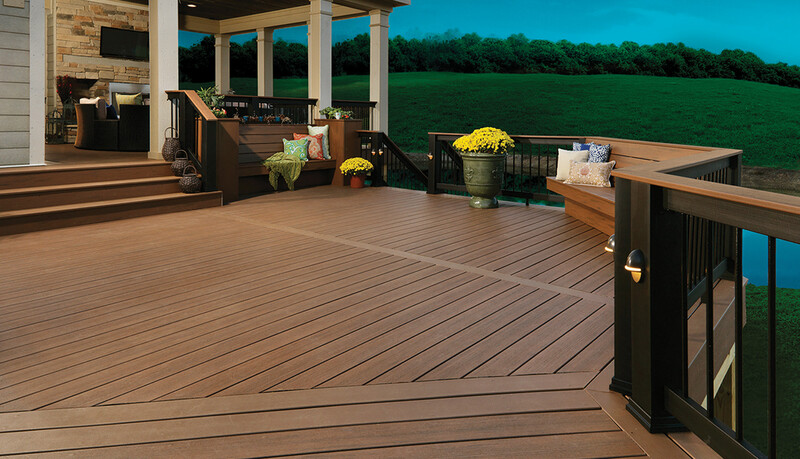 Having a beautifully finished deck is something you can enjoy all year long. Take the time to do this project right so you don’t waste more time fixing mistakes. If you have help, gather a crew and finish the job in less time without sacrificing quality of work. Love this article? Pin it to remember!